Back in November, we bought a house. 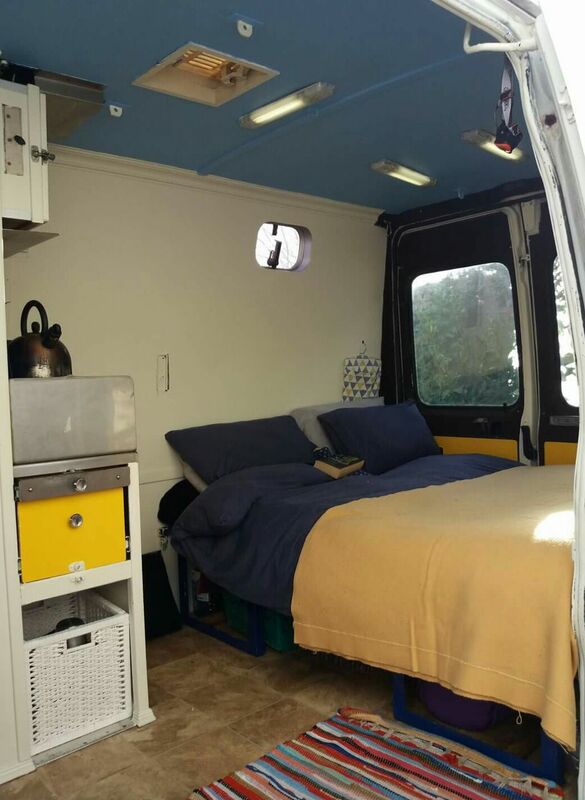 Nothing big or fancy (or mortgage worthy, thankfully) but a cute and warm and quiet spot to use as our base and to rest Dixies weary wheels between travels. The house is basically a manufactured mobile home encased in rendered concrete block, complete with a tow bar, and under the ground it is still up on wheels, we are not departing too far from vanlife you see! We had the keys in our hands within a week but any property purchase takes much bureaucracy and plenty of paperwork and above all, time. Until we actually own the place we can’t change a thing about it (which does become frustrating in such a small and cluttered space, last decorated in 1980 probably) and so we have been hanging around in a strange sort of limbo, measuring and researching and talking through the inevitable renovation. Most of our house plans are hatched from inside the van. Having a base has been great, but nothing beats waking up in Dixie, be it beside a still and placid lake or where the wild waves of the Atlantic whack the wet shore. We bought the house to escape the winter weather but here we are, already late into January and the big chill has yet to happen. The days are growing noticeably longer and the brown scrubby ground hasn’t even seen its first frost, which makes me worry and wonder. Where is winter? We spent a few days getting cozy with the heating turned right up. Warm showers, a fresh loaf of bread ever-baking in the oven, we even have an electric blanket in place of the usual water bottles. The sun, which shows up late and hangs low over the peninsula blinds us daily and the deserted beaches sparkle from afar, daring us to come walk their sandy strands that stretch on for miles, our boots making brief pooling puddles on the shoreline. In the evening our longer shadows disturb the visiting geese as we attempt to creep by unnoticed, but they notice everything and flock off in one swooping dark cloud, resettling their feathers further down the coast. Packing the van for an adventure is obviously a lot different than living in there fulltime. For a start, we can set ourselves up with a full tank of fresh water (although we don’t recommend driving far with a huge amount of water onboard for a myriad of reasons), and an empty toilet and bin. Combined with clean bodies, clean clothes and clean sheets, all of this on the same day is still such a luxury after our travels. Waiting around no matter where you are can get frustrating and this mild, calm weather wasn’t helping us. We both wanted to get away and so decided to visit nearby County Galway and the windswept bogs and burrens of Connemara for a few days to see what we could see. The answer? Very little. We woke on a coastal dirt track road near Galway Sailing Club on a very misty Monday morning. Stealthy swans and their silent shadows were all that cut through the blanket of thick white fog rolling in off the sea. Even the trees that we knew were there last night were missing, gone, swallowed whole by the deep descending cloud. Sightseeing in such low visibility conditions is not impossible but it is hilarious, and so we tried. But just as a stiff afternoon breeze began to sweep the cobwebs of fog away from the day the reliable Irish rain showed up instead, dripping, drizzling and downpouring schizophrenically. The outskirts of County Galway is full of ancient relics, stone circles and dolmens, or so we heard, although none of them is close enough to the road for us to visit without getting drenched. The rain ran rivulets down the windscreen and the roads ahead were a mucky, muddy mess. The little house when we took the keys was completely crammed full of stuff. Soft furnishings like curtains (two sets on each window) and cushions (three on each chair) and carpets swatches commandeered the living room. Overcrowded overstuffed shelves, surfaces and sills, ornaments, chintzy tchachkies, candlesticks and chipped china cups. Pots and pans and hoardes of tin cans, buckets and baskets and boxes. Hooks in the nooks, rails and nails and all kinds of holders for all kinds things that might require holding. An army of cleaning supplies, a whole set for each room, rubbers and scrubbers and personal grooming effects like shampoo and bodywash, soap, detergent and bleach, big bright bottles of liquid, lined up and facing forward behind every cupboard door, ready to advance. For a couple of people who own almost nothing in life, it was a little overwhelming. In the van we have everything we need, right where we need it. In the house right now, the opposite is true. Galway of course is on the Wild Atlantic Way coastal route and we set off through the rain hoping to find some dry place to enjoy our lunch. A beach, a viewpoint, a castle, a lighthouse, there are all sorts of points of interest along the way, but this was a first for us… a Wild Atlantic airport? Almost. Connemara Airport is a worthy WAW stop for interests sake, how odd it being on private property and it being a runway too. The view is supposedly beautiful but all we saw was more rain, more mist and more clouds, at least fifty different shades of grey. No planes were taking off nor landing, all was quiet in the foggy skies above. Across the slippy tarmac a wet orange windsock whipped in the wind. The weather that week wasn’t all fog and mist. We woke to at least one clear sight, dawn over Galway Bay. And one morning started on this lovely stretch of strand (Tracht Bay), with sunlight pouring in the back windows and warming our sleeping faces. The Flaggy Shore, although technically in County Clare, was recommended to us by many. We dashed there just as the sun came out, a rare move this week, we thought it had almost forgotten how. Immortalised by Seamus Heaney in his poem ‘Postscript’, as a bay it is every bit as lovely and peaceful as he promises. Although not September or October which is when Heaney recommends a visit to this spot, and the ruffled swans he speaks of were nowhere to be seen, the day was bright and pink and we stopped and ate by the calm shore, munching our lunch, ruminating in silence. It was beautiful. Of course the weather got worse again, almost immediately, and there we were, back in Dixie, again, staring through the rapidly steaming glass. We are usually very good at entertaining ourselves but after a few days trapped indoors moods can wear thin and we were both going a little stir-crazy. One stormy evening we hid in a warm bar in Lenane, the only patrons on a dark January night, and warmed our bones in front of a glorious open fire. In Spiddel by the pier the wild wind rocked us to sleep, egged on by the crashing smashing waves lashing against the rocks. Another blustery afternoon we visited a friend in Kinvara and hid with him in front of the stove drinking endless coffee and catching up. I love these old Irish cottages and their stonework! One afternoon, with great optimism, in spite of almost zero visibilty outside and a sleet of rain advancing on the horizon, we decided to visit one of Ireland’s most iconic buildings, Kylemore Abbey. Nestled in a valley in Connemara, perched on Lough Pollacappul, on the site of Kylemore Castle, first built by Mitchell Henry in 1867 as a romantic gift to his wife, the abbey has since 1920 been occupied by a flock of Benedictine nuns and their students. The grounds boasts a lovely Victorian walled garden and many other interesting features we unfortunately didn’t get to see. It was such a dark and drizzly day, paying into Kylemore Abbey seemed silly. We vowed to return another day to stroll through the gardens and explore the adjoining Gothic church and mausoleum. So after days of smothering in fog and hugging the coast, we decided to attempt to climb above it. Visiting this cool sculpture high up in Joyce Country was a little rough as the roads are not exactly finished but up into the clouds we went regardless, Dixies front wheel drive powering us on. The sculpture at Camus Tower is great, fun and interactive and reminiscent of the traditional moongates we once saw sprinkled around the islands of Bermuda. On a clear day the view from the hill must be incredible, we read the huge circle frames Pearses Cottage in the distance. We watched as the valley below filled up with fog and once more the rain began to fall. On our 7th day in Galway two things of note happened in tandem. First, the lunchtime pot of coffee (number three that day, but who is counting?) had to be postponed when Dixies kitchen tap unexpectedly ran dry. Sometimes its all in the angle we are parked up and sometimes the tank is just empty, in this case the latter was true. Seems we’d forgotten the back-up 5 litre bottle too. While boiling up the little water we did have, hoping it would somehow suffice, and envisioning ourselves sipping tiny espresso shots from huge camping mugs, the gas ring beneath the kettle began to splutter and spit and, like a worn out late night candle, it licked and flicked and hissed itself into extinction. I suppose that answers a few questions. We have about 7 days drinking and washing water onboard and we use about 5kg of gas every month during the winter. We were on our way to visit the village of Cong, where The Quiet Man was filmed (thats another added to the list of classic movies I have not seen), and had planned to continue to Clifden to the scenic Sky Road but water AND gas suddenly became the priority and the night was falling fast around us. Clifden was almost 2 hours away, but in the other direction, the little house was just an hour further. We decided to give up on Galway, to retreat. The weather, the water, the gas, it won. Heaney said of The Flaggy Shore “You’re neither here nor there” and we knew what he meant. Weatherwise, we were waiting for the rain to stop but its not likely to, not for a few months anyway. Mostly we were waiting for word about the house, the contracts, the sale, We set the sat nav for Belmullet, let out a collective sigh and started the engine. Just then, there was a loud knock. Travelling home, with Dixie gingerly traversing the winding bog roads and letting out a loud series of knocks every time she turned left, I felt a little down about the week, a little defeated. We now had a new priority, to make it to the local garage, urgently, that much was obvious but I couldn’t help feeling like our week in Galway was a bit of a write-off (although given our circumstances I knew better than to use that word… ) William cheered me up by convincing me that loud and repeated knocking noises don’t really matter in the grand scheme of things, and placating me with talk of central heating and electric kettles and taps that actually contain water and it finally occured to me that maybe this is the very weather we bought the little house to avoid. Although hardly freezing yet, the mist and fog and constant rain is not ideal for vanlife. Last year we had no choice, we had no where else to go. This year we do. They do say bad things happen in threes. We are so well versed at breaking down by now that waiting for roadside assistance is our specialty, we just put the kettle on and…oh wait. No water. Dixie at least had the decency to knock knock knock as far as Bangor, some 35km from home, and to cease her operations uneventfully on a safe side street. I called in our location, we walked to the nearby corner shop for a bottle of water and bought ourselves an ice cream instead, the day too late for coffee, too early for tea. While we waited for AA we received a call to say the papers will be drawn up this week and the house will be ours. The mechanic I’m sure was wondering why we were so happy, standing at night in the January rain beside our broken van, eating icecream, smiling from ear to ear. We didn’t overnight at the Flaggy Shore this time but I’ve since read G.B.Shaw and W.B.Yeats both took some inspiration there and I would love to go back and see it at very first light. Just a CV joint, not a total disaster in the greater scheme of things! FWD vans do put a lot of pressure on a CV joint, but it should be good for 60 or 70,000 miles now. love that you all venture out even when the weather is less than good………such wonderful adventures you have had. Sounds like it was a stressful time but you remained positive! We went camping in Galway in the summer and it rained then too, we returned in the winter and stayed in a hostel and it was very foggy so sadly we couldn’t see the views either. Lovely pics, inspite of the weather! Brilliant Liz we would love to have you both here although i suspect we will be up on Cruit Island soon too! !